What to do in Nova Gorica and Vipava valley? Nova Gorica is a “young” and modern Slovenian city lying next to the Slovenian and Italian border. The proximity of Italian city of Gorizia and Italy offers visitors of Nova Gorica a lot of activities to do and sights to visit. Nova Gorica is famous as a gambling city, since you will find more casinos here than anywhere else in Slovenia – casino Perla is the most famous and is also featured as the biggest casino in Europe. 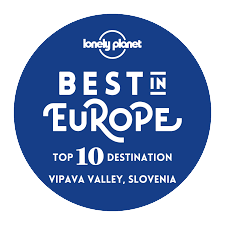 Nova Gorica is also a great starting point for trips to Slovenian coast (approx. 40 minutes), nearby Italian seaside (approx. 25 minutes), trips or hikes on the paths of the Soča front (Isonzo Front) from World War I. You can also visit Julian Alps or follow one of the many wine roads that you’ll find in Vipava valley, Brda (Collio) or Kras (Carst). You can also try wines and culinary delicacies from this regions in our Termika restaurant. Contact us and we’ll be happy to help you choose the best itinerary for you. We have also made a list of top ideas for trips / sightseeing during your stay – have a look below. well-known bridge across the Soča River in Solkan, on the railway from Jesenice to Nova Gorica. The length of the entire bridge is actually 220m. The mountain top with a long pilgrim tradition is home to a magnificent basilica dating back to the 16th century. The mountain lies at the crossroads of the Vipava and Soča Valley. With its altitude of 682m, it offers amazing views. On a clear day, visitors can see as far as the Julian Alps, the Trnovski gozd Plateau, Karst and even the sea, the Brda Hills, the Friulian Valley, the Carnic Alps and the Dolomites. On Sveta Gora, there is also a museum dedicated to the Battles of the Isonzo and a monastery which houses a Marian Museum. Close to the Slovenian-Italian border is the Kostanjevica Hill at 143m above sea level. It is home to the Church of the Annunciation of Our Lady and a Franciscan monastery with rich treasures from the past, including a fabulous library. The last members of the Bourbon French royal family are buried in a crypt beneath the church! There is also a collection of Bourbon roses. This is a fortified settlement with a hugely prominent panorama. Its walls and the village centre are well preserved and comprise of two streets around the church and its feature bell tower. The entire village has been declared a cultural heritage monument, like Štanjel and Vipavski Križ. It is also home to a museum collection showing everyday village life at the beginning of the 20th century. Lijak is a strong but irregular karstic spring for a stream with the same name, flowing from the steep edge of the Trnovski gozd Plateau. In the rocky slope above Lijak, there is a 15m long by 10m high natural bridge with a cave referred to as “Skozno”, which offers an amazing view of the Vipava Valley and the Friuli Region. The area surrounding the Lijak Stream is protected as a natural monument. About 3km from Ajdovščina, the Hubelj River rises from a spring. During the rainy season there is a swift flow through Ajdovščina. There are three Karst springs for the river – seen as waterfalls at the foot of the Navrša Hill. At the village of Dolenje, the river flow into the Vipava River. The spring is especially picturesque at high water levels. There is a restaurant near to the spring where you can find a looped educational path. On this trail you can see different tree species and rocks. The Lipica Stud Farm is the cradle of all Lipizzaner horses in the world. Its rich history reaches all the way back to 1580. For centuries, it has boasted the tradition of breeding and selecting pure-bred horses. In the 1960’s the Lipica Stud Farm established the Classic Riding School, which still participates in worldwide equestrian events. In 2010, the Lipica Stud Farm celebrated its 430th anniversary. Štanjel is one of the oldest and most picturesque villages in the Karst region. Rows of houses are scattered along the terraced slopes on the 364m high Turn Hill. The most notable features of Štanjel are narrow streets with stone built houses made with different stonecutter products. As one of the most important caves in the world, Škocjan Cave represents the most significant underground phenomena in both the Karst region and Slovenia. The underground canyon of the Reka River is the largest known underground canyon in the world. Due to their exceptional importance, Škocjan Caves were entered on UNESCO’s list of natural world heritage sites in 1986. Features of Škocjan Caves: extremely diverse stalactite forms including limestone pools, larger stalactites in the Great Hall, with the mighty “Giant stalagmite”. Postojnska jama / Postojna cave is the largest classical karst cave and a network of 20 kilometers of passages, galleries and chambers, in which experienced guides have accompanied more than 30 million visitors in 185 years. Today you visit the cave with the train. In addition to visiting the caves, the rich underground of Slovenian karst also offers real caving adventures, such as cave trekking or teambuilding. A guided visit lasts an hour and a half. Only 10 km away from Postojna Cave there is one of the most picturesque wonders of human history – Predjama Castle. It reigns in the 123-meter cliff for more than 700 years, powerful, defiant and impregnable, a perfect hideout for the bold, headstrong and rebellious knight Erasmus Predjamski from the 15th century. Why not visit Ljubljana, the capital of Slovenia and discover some other places in its green surroundings. Ljubljana has everything you would expect to find in a modern capital city, but has managed to preserve the nice, pleasant atmosphere of a picturesque and lively city, full of surprises. In Central Slovenia, the Alpine landscape meets the Karst region. This is how some unique natural and cultural features arose, such as: the Ljubljana Moor, and the Velika Planina Plateau in the Kamnik Alps with Europe’s oldest shepherds’ village and a mountain ski slope. You won’t get bored here. Many cultural events take place and showcase traditional and modern creativity. By taking a boat trip along the Ljubljanica River, you can experience the old city centre and its remarkable bridges, picturesque façades and quays from a different perspective. Bled, with its glacier lake, famous island and Bled Castle is one of Slovenia’s most popular holiday resorts. The town is famous as the home of the original Bled “kremsnita” (Crem Schnitta or cream cake) dessert. Not far from Bled you can visit the Vintgar Gorge where, along the narrow passage, the Radovna River thunders loudly over cascades and rapids. Why not stay at Park Lijak campsite and go for a day trip to Bled and taste the Crem Schnitta? On your own or with an experienced guide – but always respect nature! The Bohinj Valley and the Triglav Nation Park are a great starting point for walking and hiking tours to the mountains. Bohinj is a geographical name that covers the Upper and the Lower Bohinj Valley region, being the Nomenj Valley and Lake Bohinj. Bohinj lies in the south-eastern part of the Julian Alps. There are many marked hiking paths in the Julian Alps and a network of mountain huts open to visitors. We recommend: the Cheese-maker’s route, Hema’s pilgrim path, the Pokljuka Trail, Via alpina, or a boat trip on the lake. The Kobarid Museum displays exhibits on the events that occurred on the Isonzo Front during World War I. It covers two and a half years of toe to toe fighting and portrays in detail one of the major battles known in human history. The exhibits – giant models of the surrounding mountains, a wealth of photographs, and an audiovisual presentation – sensitively explain the events of those difficult and bloody days at the Soča River. These events are put into context with the adventures and memories of famous people who were there, including Ernest Hemingway and Erwin Rommel. The Kobarid Museum has received the highest national award, being proclaimed Best European Museum, and also won the Council of Europe Museum Prize in 1993. Guided visits to the battlefields are available. Guided tours in six languages start from April to September. Piran is a Venetian style harbour town on the Slovenian coast. It is a peninsular town almost surrounded by sea and is close to Slovenia’s largest seaside resort of Portorož. The town resembles a large open-air museum, with rich cultural heritage and hosts a wide range of events, concerts and exhibition. A town of excitement and relaxation. The Sečovlje Salt Pans are the largest active salt evaporation pond in Slovenia, located along the mouth of the Dragonja River near Sečovlje. Nowadays, salt production is still continued to preserve natural and cultural heritage. In addition, the salt pans are home to many plant and animal species. In the past, the whole family would live at the salt pans, producing and harvesting salt during the hot summer months. Salt is harvested from the salt pans which comprise evaporation and crystallisation ponds, using the free fall method or pumps. The inhabitants of Piran would start the salt harvesting season with mass departures of families to the salt pans on the St. George’s Day holiday, 23rd April. The season would finish on St Bartholomew’s Day, 24th August. Venice is a world famous coastal city with countless channels and bridges. The city stretches out across many small islands in the marshy Venetian lagoon along the Adriatic Sea in northeast Italy. – the Carlo Goldoni Theatre, and the Venice Biennale.